There's more to this survival horror adventure than just the story campaign. 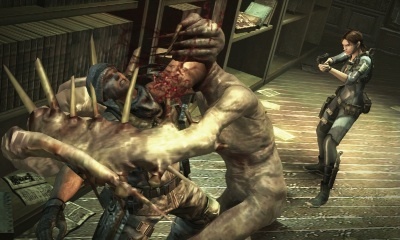 Resident Evil: Revelations continues to be one of the finest looking 3DS games to date. Turns out, there's plenty of interesting content behind its glossy exterior. Hold still, Chris. It just wants to taste you. Capcom just revealed Raid Mode, a bonus feature where one or two players co-operatively tackle specially designed missions crawling with enemies, both through local and online play. By destroying these creatures, players can level up their characters and unlock new weapons. Additionally, killing monsters results in points that let gamers acquire a variety of useful weapon upgrades. From what we've seen, Raid only features Chris Redfield and Jill Valentine, which should break the hearts of all those Parker Luciani fans out there. Resident Evil: Revelations arrives on 3DS February 7.